Recently a video was posted online showing a huge triangle 1.5 km wide soaring above the Moscow Kremlin. It was sitting above Red Square and shot by amateurs twice. The video was widely discussed in foreign communities interested in ufology. According to a former UFO analyst of the British Defense Ministry, this is the most bizarre and unusual video of a UFO he has ever seen. On October 7, 2009 a strange round cloud resembling a saucer was shot above Moscow Ring Road. At first it was noticed above Leninsky Prospect metro station, which is in downtown Moscow. According to employees of the independent group “Heritage,” the object probably wanted to provide encoded information that Earth is threatened by asteroids. On October 27, two days after the researchers presented at the 14th Ufology Conference, the media, referring to NASA, released belated information about a meteorite explosion above Sulawesi Island. In the evening of December 21, 2009, a reporter of Komsomolskaya Pravda who was shooting the panorama of Red Square unexpectedly shot something that looked like a stick with six wings. He did not see anything while he was shooting and only saw it on his pictures, as it often happens with UFOs. 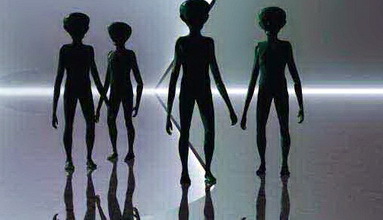 Some hot heads stated that these are live beings unknown to science. Others think these are creatures that came from plasma world inhibited by souls and ghosts. UFOs above Moscow are not a frequent event, but not exclusive one either. In winter of 1584, a cross-shaped object with a lit up bubble in the center was seen in Moscow sky in day light. Ivan the Terrible, who was then the Tsar, came outside as soon as he heard about it to “see the miracle with his own eyes.” The witnesses said he watched it for a while and then said, his face pale, that it was a sign of his death. It was indeed his last year. Fireballs are also frequently seen in downtown Moscow. On August 5, 1977, three fireballs were seen. One came down on Ivanovskaya square, another one disappeared in Tainitsky garden, and the third one flew into the Archangelsk cathedral. It moved along an S-shaped trajectory because the entrance to the cathedral consists of two pairs of doors. From the entrance the fireball moved to the altar, banged against the Tsar gates and exploded. A black spot remained on the altar from the explosion. It is hard to believe that this was an accident. Some scientists believe such phenomena to be signs of the future. But what do they indicate? Some extraordinary future events? Or, maybe, aliens are trying to tell us that they support us in tough times? We shall see.